Schwab’s Robo-Giant Unleashed: Could It Help Advisors Gain Clients? As Schwab launches its Intelligent Portfolios platform, project head Naureen Hassan tells ThinkAdvisor what to expect from the RIA version. Charles Schwab launched Monday the retail version of Schwab Intelligent Portfolios (SIP), the highly anticipated retail client version of its made-from-scratch digital advice, or robo-advisor, offering. Available now at Intelligent.Schwab.com, SIP is a paperless platform available to clients with as little as $5,000, who can create an ETF-only portfolio using 54 ETFs representing 27 asset classes from 11 fund families — including 14 Schwab ETFs — that were a result of an objective, rigorous screening by Schwab, the company said, along with an FDIC-insured account for the cash portion of a portfolio. Accounts with a minimum of $50,000 also have access to automated tax-loss harvesting; all will have access to automated portfolio monitoring and account rebalancing. The ETFs were chosen by Charles Schwab Investment Advisory (CSIA), and the process uses a CSIA algorithm to pick specific ETFs in a portfolio. CSIA will have discretion over the assets in SIP, and the choices include Schwab-branded ETFs and funds from third parties including Vanguard, iShares and PowerShares using quantitative criteria offering low risk (no leveraged, actively managed or single-country ETFs), adequate size for liquidity, narrow bid-ask spread (no spread more than 25-30 basis points), high consistency tracking to its index and a low operating expense ratio (OER). During the onboarding process, users are given the option to chat in real time, to contact a Schwab branch or to call a Schwab call center staffed with specially trained personnel. Mark Riepe, president of CSIA, said the ETFs would include both market-cap based ETFs and smart beta products that will allow users more “personalization” of their portfolios: “investors want portfolios to reflect” who they are, he said. As for the cash portion of the portfolio, Riepe said, “I think of cash as just another asset class” which adds diversification — “it has the lowest correlation with every other asset class” — as well as inflation protection: “when inflation picks up up, yield will rise on cash.” Finally, “from a philosophical standpoint, we think a cash cushion is important to help investors stick with an investing plan,” he said. 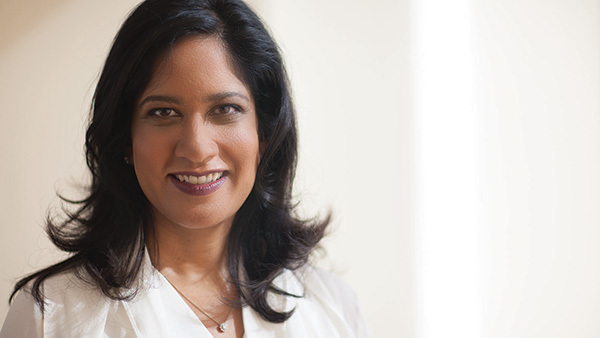 In announcing the launch during an online press conference, Schwab Executive Vice President Naureen Hassan, who heads the Schwab Intelligent Portfolios project, said that Schwab had received 28,000 inquiries since it first announced it was developing SIP last October. Of those inquiries, Hassan said, only half were from existing Schwab customers; and of that group, 50% reported having more than $250,000 in assets. In an interview following the press conference, Hassan said that the advisor version of Intelligent Portfolios–Institutional Intelligent Portfolios–was in development and on track to be released in the second quarter of 2015. As for the retail version, Hassan said that when new users sign up, the final question will be “Do you want to talk to a financial professional?” Calls from those who do want to talk to a person will be directed to a team “that’s skilled enough to vector clients to the right” solution, Hassan said. “If they have more sophisticated needs,” Hassan said, the team “will follow our standard” referral protocol, to either a branch or to a Schwab-custodying independent RIA. Referring to those 28,000 inquiries received since SIP was first announced, “half of those calls are prospects,” Hassan said, and thus “SIP could be a foot in the door” for clients who may want advisors. As for Intelligent.Schwab.com’s design, Eliel Johnson, VP and head of user experience for Schwab, said the site was built with a mobile experience in mind, though it can be used by owners of desktop machines as well. Users can fund their accounts using mobile check deposits via smartphones’ cameras, and additional funding can be made automatically on a recurring basis. In the interview, Hassan said there will be two SIP models for advisors who custody at Schwab to choose from, if they wish. One will come at no charge to advisors using the standard 54 ETFs in the retail version, but white-labeled with the advisor’s name and chosen colors, while a second would allow the advisor more customization and flexibility, including an advisor console allowing the advisor to offer additional ETFs they choose. Hassan said that Schwab found last year in ints annual Investment Advisor outlook that 56% of advisors saw a digital advice product like Institutional Intelligent Portfolios as a “supplement” to their business model, and pointed out that according to an investor education report from the Financial Industry Regulatory Authority, only 30% of Americans have sought financial advice over the last five years. “Inertia, trouble with opening accounts and cost are roadblocks” for those investors, Hassan said on the conference call.